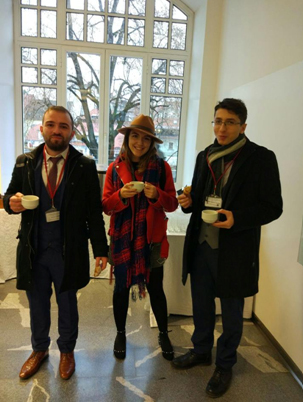 To represent Istanbul Center of International Law (ICIL) and Turkey, as team composed of students from different university, three members of ICIL family participated to the “All European International Humanitarian and Refugee Law Moot Court Competition” organized by Ljubljana University of Slovenia, this year. In this paper, general informative notes on moot court competitions and particularly about this competition will be given. Publication for applications of case was announced in 15 May 2017. In 15 September 2017, the case-study for the competition was published and forwarded to participants. Yet team works, which started towards the end of August 2017, intensified in the following month on the concrete subjects related with the case. The studies during the preparation process are conducted with the many meetings on a face to face basis or via online platform with team coach. With the publication of rules of procedures, related rules running the competition have been learnt. The only valid language used in Competition is English. In ordinary moot court competitions there is an additionally memorandum writing which is similar to plaintiff and respondents petitions respectively, and the claims to be presented in the case proceed through these documents. Moreover, procedural rules of the moot court competition generally comprise detailed procedures related with the composition of the court and the appointment of the parties. However, due to the reason that the competition our members participated did not require memorandum and specified composition of the court and appointment of the parties in its procedural rules, we could not particularly emphasized on the facts of our party, but rather we studied all related subjects at the same time. After that the competition was held around 21 November and 25 November in Ljubljana, Slovenia. The detailed procedural rules on the composition of the court and appointments of the parties were given each time either 30 or 45 minutes before each rounds. In advence to these rounds, participants are informed about the party that they are going to plead on behalf of, before the court and which role they will be playing during the hearings. From the point of view until here, it could be said that the preparation process was intensive but at the same time instructive. The studies followed have provided an opportunity to have deep knowledge of International Humanitarian Law and International Refugee Law. Furthermore, the two sub-branches of International Law; namely, International Criminal Law and International Human Rights law, which used additionally in the case, has given us the ability to make comprehensive assessments on the complicated issues. Besides, thanks to the competition, it is also informed on the application of theoretical law to the concrete cases to evaluate states, relations of states with not only their citizens but also those who are under the their jurisdictions, and relations of states with other subjects of International Law, in specific context concerning abovementioned areas. In addition to all, by studying together and in harmony, our participants have remarkably experienced on these areas which have been studied rarely in Turkey. In this context, we express our thanks to team coach Dilara Yurtseven, who at the all stages of our preparation helped and spared time among her greatly intensive works, and to General Coordinator of ICIL, Onur Dur, who at all phases provided his supports.